In 2017, I re-organized the Reading Lounge, which was envisioned as a place with three missions. Be a place where teachers can easily check out class sets of books that connect to the Middle School curriculum. 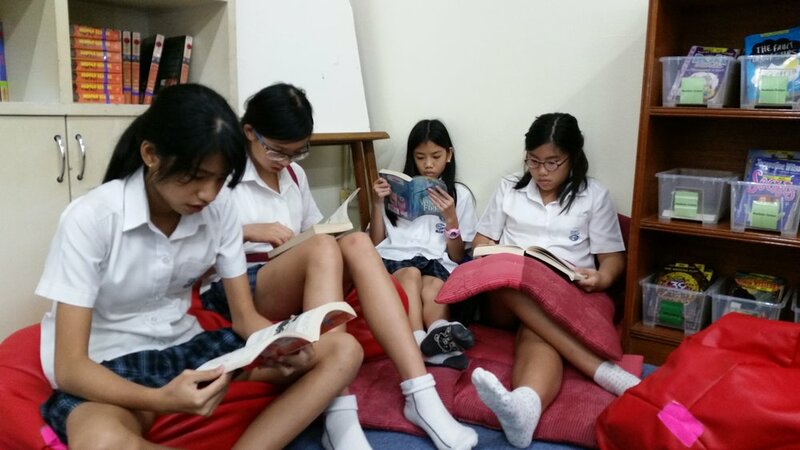 Be a mini-library where students can easily check out high interest novels. Be a fun space for teachers to bring students to read independently. In the Reading Lounge, we have invested in small sets of books that can be used for small group reading. For our department to strategically plan Literature Circles, Reading Groups, and Book Clubs, we needed to know what titles were available and how we could split the titles among grade levels. My first goal for the Reading Lounge was to make the space functional for teachers who need to find class sets. This required locating duplicates of books, counting them, determining their genres, storing them in cabinets, tagging them with labels, and creating a visual to help teachers navigate the cabinets. My second goal for the Reading Lounge was to develop an organization system that would help students find books, which were scattered across the room in a random order. This required inventorying each book in the reading lounge, researching whether or not the books were part of a series, purchasing boxes for the series, creating box labels for book series, and creating visuals to help students navigate the boxes. Once the books were organized, I realized that we were often missing integral books in a series. For example, we might have the second and fifth book of a five book series but be missing the first, third, and fourth. I created a purchasing priority list to help guide administration in future purchases. Through the course of four orders, we were able to fill many of the holes in our series and designate them as finished! Based on information from our librarian, I made tutorials for students that explained reading topics, including checking out e-books and searching for books on the library's website. I also created a tutorial explaining the check out process for teachers who visit the Reading Lounge. 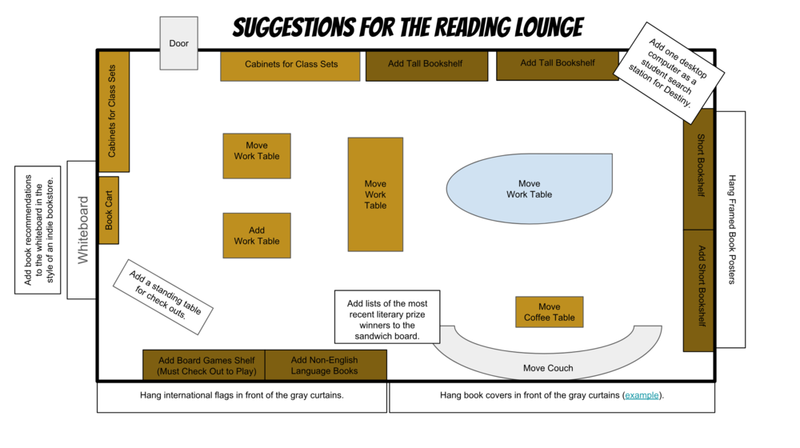 I also suggested implementing changes to the Reading Lounge's layout that would increase its functionality. The map is below. A room like this all about positive experiences. Students should have positive experiences reading, and teachers should have positive experiences finding resources. We are hoping to double the size of the Reading Lounge by knocking down a wall and combining the current space with an adjoining room. When this happens, we will implement a newly designed, modern layout. Whether it is in the old space or the new space, the room will still be all about positive experiences.